We’d love to have you worship with us. 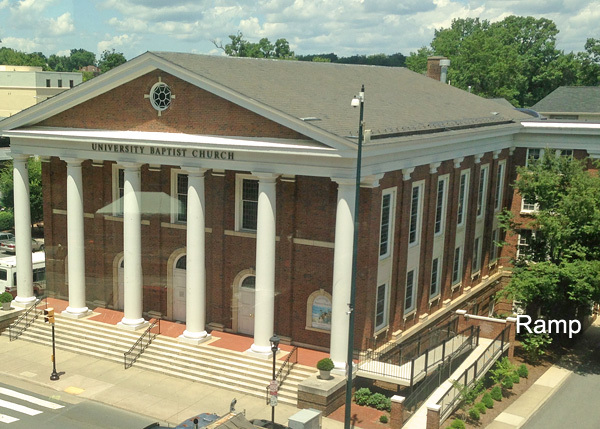 Directions are posted below, or use a GPS to find 1223 W. Main Street, Charlottesville, VA.
UBC will be on your right. 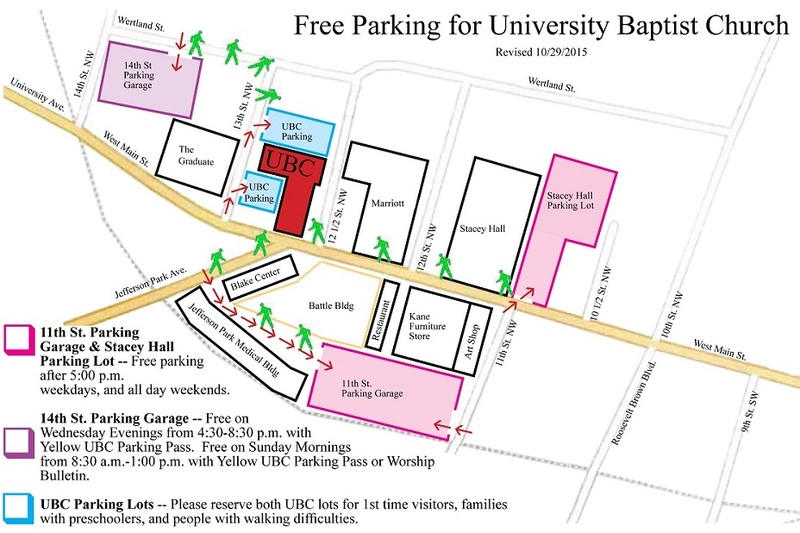 Turn right onto 13th Street; UBC parking lots will be located on your right. UBC will be on your left. Turn left onto 13th Street; UBC parking lots will be located on your right. Although parking can be a challenge in downtown areas, we are fortunate to have ample parking within walking distance of the church. We recommend that you arrive early to assure yourself of a visitor’s parking place in our front or back lot. We ask our regular attenders and members who are capable of a little walk to use street parking or one of the nearby free lots shown on the map below. We have a ground-level wheel-chair accessible entrance from our back parking lot (where we also have several handicapped parking spots reserved). There is an elevator that can take you from the ground-level to the first floor, where the sanctuary is located. We also have a wheel-chair accessible ramp located at the front of the sanctuary entrance on West Main Street. That ramp will take you straight to the narthex of the sanctuary.